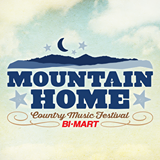 BOISE, Idaho, July 26, 2016—The Mountain Home Country Music Festival is this weekend, July 29-31. The festival is held off Highway 20 and Forest Road 61 on private land that borders Forest Service and Bureau of Land Management fire protection areas. For more information, go to the Boise National Forest Facebook page U.S. Forest Service - Boise National Forest and idahofireinfo.com.